Hillsdale, MI. When I first thought about writing this it was the “Ten Dollar Tomato.” But historians are more or less required to tell the truth, and it now costs amateur (literally, “lover”) gardeners about five times as much to grow a good old beefsteaker as it did in the early 80s. I asked my freshman class a few weeks ago who can send a text message? All of them, of course. Who can grow a tomato? One bold young woman said she can, but recanted after my second question. All but two (out of twenty-three) admitted that they would not know home grown from store grown. My own daughters, less than a generation removed from the farm, freaked out when they figured out that the cow tongue sandwiches (which they loved) their mother had been making them for years were made out of the tongues of cows! You can get cow tongue at WalMart, and tomatoes at Piggly Wiggly, but neither one resembles what my wife used to carry up to the house from her grandpa’s slaughter-barn or what I have grown in the back yard for about fifty years. The sad thing, though, is that about one in a million Americans has access to fresh cow tongue, and just about the same number can really understand Guy Clark’s song about tomatoes. And there’s another sad thing. If you are a good Porcher and want to learn the difference between home grown and store grown tomatoes and maybe even grow some yourself, the first few nice meaty firm heritage beefsteakers will cost you about fifty bucks apiece. By the time you start getting the cost down most of you will have given up. As Wendell Berry can tell you, growing stuff ain’t easy. First off, if you’re a semi-urban type, you have to get three or four dozen up-scale gardening catalogs. They’ll tell you all about the right kinds of soil, watering systems, fertilizers (organic, of course), raised beds, seeds, hoses, hoes, friendly predators, diggers, deer discouragers, fences, indoor lighting systems, seed-starters, pots, potting benches, composters, compost starters, muck boots, knee pads, gloves, broad-brimmed hats, sun screen, tomato cages, companion plants, and about a thousand other things that the well-equipped gardener can’t live without. The last time I priced out the starting investment for a new semi-urban gardener (a decade or so ago) it was about ten large. Second, if you put a value on your labor–let’s say you’re an auto worker and make about forty bucks an hour plus benefits–the first tomato will cost you another grand or so. More, of course, if you are one of the obamarich and make, say, 250 big a year. Third, a tomato is not a tomato is not a tomato. Is it a fruit or a vegetable? Do you like heirlooms or hybrids? What predators are you willing to share with? Do you like salads or sandwiches or tomato juice? Every choice costs money, and every choice costs labor. Fourth, if you grow tomatoes you must plan your vacations around the growing season, or else plan to get a good enough tax lawyer to write off your failed crop. Like dairy cows, tomatoes do not take time off. I guess you could justify growing tomatoes by the money you save not going on vacations. Fifth, you can also save money by not having your nails done. 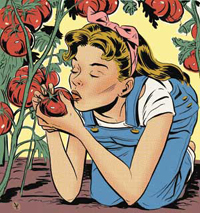 Tomatoes require dirt, and growing them requires getting your hands in it. If you use natural fertilizer there is a healthy aroma that goes along with the stuff under your fingernails. Homegrown tomatoes in every yard you see. I could be pushin’ up homegrown tomatoes. I spent most of my professional life getting paid to read, write, and talk. That someone was willing to pay me to do the things that come the most naturally to me was always a mystery, but always welcome. It required, however, that dirt and tomatoes had to come into my life (just as rugby had when I was younger) because like any good Aristotelian I was always looking for the mean. Guy Clark gave sense to what I was doing. Love is a good thing, even at fifty bucks a tomato. Next articleWhat Does it Declare? I don’t really like tomatoes, so I’ll save myself the trouble. I might try to grow sweet corn and rhubarb, though–rather less taxing than tomatoes, I think. I now have Guy Clark down as #162 on the list of reasons I should be ashamed to be ashamed to be from West Texas. His story is especially convicting: he hails from Monahans, a neighbor town of my own, Odessa. We Odessans, when considering the tragic misfortune of growing up where we did, often console ourselves with the knowledge that Monahans is so much crappier. Tomatoes are not easy to grow in West Texas. Neither are people. I’ve learned in the last few years that this was not always so. Really? $50 a tomato? Maybe for the gourmet. All I needed was some lime and fertilizer to balance my kooky urban clay, some dug in leaves and home-generated vegetable compost (just pile it out back and let the beetle grubs and slugs have at it), a roll of fencing for tomato cages (received as a delightful Christmas present), some salvaged wood for stakes (people are always leaving sticks and discarded wood from remodels along the sidewalks for trash pickup in the neighborhood), tools (we had pick, shovel, and rake already), and a $2 one-time investment in a non-hybrid seed from a variety often sold at the farmer’s market, so I know it does well around here. I grew the seedlings in tomato cans and discarded plastic pots from a neighbor. I save money on gym memberships and emotional health (ain’t nothin’ better than hacking a large bush to bits, grubbing out the roots, and replacing it with something wonderful to eat when life gets frustrating). You can go on vacation by picking off the larger green ones and letting them slow-ripen indoors while you are gone, or letting a neighbor pick them to keep (the most hardened urbanite can find the RED ones, and people with kids often like the easter-egg-hunt aspect). Corn, on the other hand, waits for no man, and requires some expertise in recognizing the optimal moment. Yeah, it is work, but you’d be vegging on the couch in front of a glowing rectangle, anyway, and is THAT worth your hourly wage compared to red/yellow/purple globes of acidic goodness? I did meet a few tomato hornworms in my backyard jungle this year, but some hand picking and drowning in soapy water took care of that. They were always posing at the top of the plants in the evening as if to show off their destructive handiwork. Destructive, but dumb. By the end of a normal hot, dry summer in TN, those tomatoes are a few cents apiece and your windowsills and countertops are overflowing from a few plants. You don’t even have to weed, as indeterminate vines drown out all competition. Even this year, I still have window-sills full ripening in December! If you have too many you can throw them, whole and raw, in gallon-size zipper bags in the freezer to cook down for sauce on a winter afternoon when the house needs some humidity. Well worth growing, even just in a pot or a small flower-bed. $50 a tomato? Not in my yard. Well, by the looks of the big photo in the N.Y. Times yesterday of a young Chinese Male swooning over an Blinged-out Escalade at a Chinese Auto Show, where Chinese consumption of cars now exceeds American consumption…and the American manufacturers are holding their own there…but it would seem that even money can be bet on the prospect of our Inscrutable Banker enjoying well-soiled and watered America as her garden plot….thus introducing your students to the many steamy pleasures of Tenant Farming. Fantastic – the more people know about the great Guy Clark the better. Can’t think of a better antidote to what passes for “country” music these days. Guy Clark’s records in every iPod you see. See, you know some…stuff. One in a million. The guy who was our county agricultural extension agent tells me that I’ve overunderestimated–that most “urban gardeners” probably will get the first few tomatoes for about $75 each. It’s like the urban golfer. The first putt that falls in the cup probably cost a couple of grand. Your story sounds like somebody who already knew some…stuff before ever dreaming tomato dreams.